The ankle consists of several ligaments both on the inside and outside of the ankle. The outer 3 ‘lateral’ ligaments are inelastic, providing a more rigid support to prevent the inwards rotation of your ankle. An uncontrolled roll over the ankle overstretches these ligaments. Depending on the force or speed or previous sprains, the extent of the injury can be minor to a rupture of 1 or more of these ligaments. Pain is not an indication of severity of injury. Other structures may also be injured, for example an avulsion fracture, bone bruising or tendon injuries. 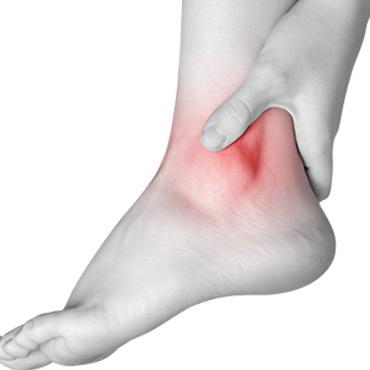 Achilles Tendon pain - The Achilles tendon connects the 2 large calf muscles to the heel. Various injuries occur within or around the tendon (for example tenosynovitis, tendonopathy in 3 different stages, intra-tendon tears, insertion inflammation and bursitis). The injury depends on both the loading and general health factors such as blood pressure, cholesterol, medications (for example roacutan and quinilone anti-biotics), oestrogen drop in perimenopausal women. Severes Disease in immature skeleton occurs at the growth plate where the Achilles attaches. Other tendon injuries on the inside, outside and in the arch of the foot. Stiffness in the ankle joint causing pain – restriction of joint movement due to a sprain or tight calf muscles can cause the movement at the joint to change and subsequent pain.